A massive well done to Hugh Vlatas who this year managed to complete the 3 peaks challenge! On top of this Hugh has managed to lose weight and increase his fitness levels massively. Well done Hugh! Before I started training with Chris I was mainly swimming however this became very boring and repetitive. I never thought I would be able to train in the gym due to a history of back issues. 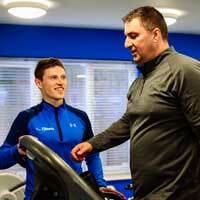 Chris has tailored my training sessions to my goals/injuries and has even helped reduce my back pain. Training with Chris has helped me with continuity of training and I have never in 40+ years kept up with training as regularly as I have over the last 3/4 years. I am loosing weight steadily, still a way to go but fired up to do so with lifestyle change not just diet. in 2017 I managed to complete the 3 peaks challenge and I wouldn’t of been able to do this without my sessions with Chris. I would highly recommend him to anyone looking to get fit, lose weight and improve their lifestyle.